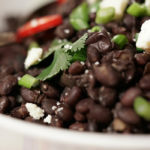 Vegetarian Black Beans are creamy, flavorful and easy to make. Enjoy a filling meal (without a lot of calories) or pair them with tacos for an easy side dish. Learning how to cook black beans is easy. Whether you use the stovetop, slow cooker, pressure cooker or Instant Pot this blog will tell you everything you need to know about how to cook black beans! Pour the dried beans into a colander. Carefully pick thru them, removing any rocks, dirt clods or blemished beans. Rinse thoroughly under cold water until the water runs clear, set aside. Peel and dice the yellow onion, mince the garlic. Set your Instant Pot on sauté and allow to heat for one minute. Add the olive oil and diced onions, sauté for 3-4 minutes. Add the clove of garlic and sauté for another minute or so, just until the garlic becomes fragrant. Add the remaining ingredients except the salt and enough liquid to cover 1 inch above the level of the beans. Add the Instant Pot lid and seal. Turning valve to seal. Change to manual setting and set timer for 45 minutes. When the timer is done, natural release (NR) for 10 minutes. Check seasoning - this is the time to add salt. You'll need to add 1 to 1 1/2 teaspoons salt to taste. Top with sliced jalapeños, salty cojita cheese and sliced green onions. If you add salt at the beginning of the cooking process the texture of the beans becomes tough. Do not add salt until the beans are completely cooked and then add salt accordingly.